I'll be really, really upset if H and K aren't an integral part of it. H should be in the bridal party and K should be best man! OK, OK, OK so you have human friends for that, but you can improvise. Have the human best man take the ring from K, maybe in a backpack-after all it's really K who's giving Mom away but also staying. Have H throw the bridal bouquet, OK, so what if she eats it? She needs her veggie vitamins and nutrients. For crying out loud, no doggie clothes- you can put a bow on H's head and a bow tie on K-no tuxes or long dresses. 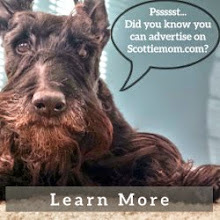 It sounds like you need a Scottie curmudgeon to run the show. Oh yeah!!! They HAVE to be in the wedding!!! 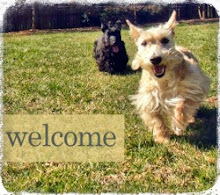 It is "their" big day also... After all...didn't they have to "approve " of Scotty Dad??? We think Kyla may have finally found her calling...wedding planner!!! I have to agree with Kyla, bow and tie I think for Scottie's. C'mon Scottie Dad. Pretty Please. C'mon Scottie Daddy. You have to have your babies at the wedding.